This pre-interview preparation checklist is going to show you exactly what to do before your interview to walk in confident, over-prepared, and ready to get hired. If you have interviews coming up, this will help you immediately. Also find their competitors. I like to use similarweb.com for this. (note: this works best for finding competitors of large companies). When and why were they founded? What do they sell, how do they make money? Do they have a mission statement? What is it? How many employees do they have? (get a general idea – is it less than 200? thousands? more than 10,000? etc. You can usually find this quickly on LinkedIn). Okay, that’s how to research a company before the job interview. If they invited you to interview, they liked something on your resume! So they’re probably going to ask about certain pieces. They’re also likely to ask a question like, “tell me about yourself“, and you’ll need to be ready to walk them step-by-step through your recent experience and accomplishments. So make sure you’re familiar with your own resume before going into the interview. And if it’s a phone interview, print out your resume and have it in front of you. Hiring managers love this stuff. You should already have this on your resume, but either way – prepare specific stories and facts/metrics you can share. Don’t just say “in my last job I was responsible for ___”. What did you accomplish? Give exact data. Did you exceed your goals? By how much? Did you help the company make money, save money, save time, etc.? How can you quantify this? That’s how to impress them and get noticed. If possible, research the people you’ll be speaking to. Check out their background on LinkedIn. Are they more of a technical person, or do they have a background in HR, etc.? This will help you anticipate what types of questions they will ask. If you don’t know who you’re going to be speaking with, ask whoever scheduled the interview for you. They might not be able to tell you, but there’s no harm in asking. I’ll cover more about how to prepare for the questions you’re likely to face later in this interview preparation checklist. Here are the 105 best questions to ask in an interview. You should have a mix of questions about the job, the group/team, and the company. Don’t ask about things like salary, benefits, working hours, etc. It’ll make you seem more concerned about this stuff, and less concerned about the actual job. Employers want to hire someone who is focused on coming in and helping them succeed. You need to play the game if you want to get hired. Let them bring up salary, benefits, etc. (usually after a couple rounds of interviews once they know they’re interested). If this is your first interview with a company, you can skip this step. If you’ve had other interviews with this company… think about what they asked you and seemed to emphasize. If they asked you multiple questions about a topic, it’s likely to be something they care a lot about. So if you’re speaking to somebody new in this interview, expect similar questions. Don’t assume you’re “safe” just because someone asked you about a topic in a previous interview. You will probably be asked again. While we’re talking about knowing what they’re likely to ask… I want to mention another place to get clues about what to expect: the job description. 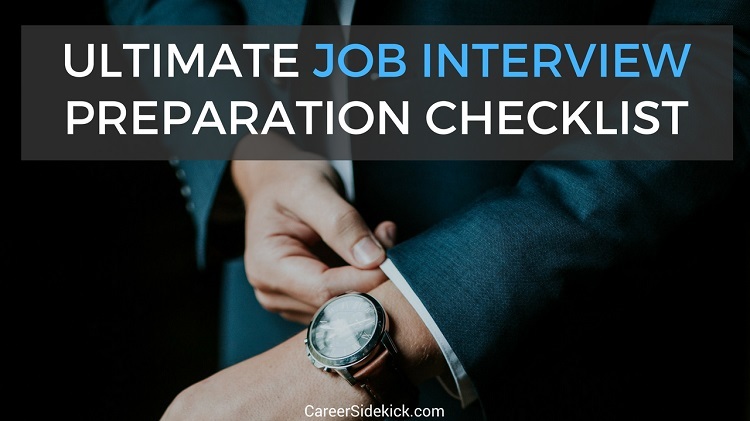 This is one of the most important parts of any job interview preparation checklist. Go read the job description and see what they mention most often, and what they emphasize or mention first in the bullets and requirements. Those are also things you’re likely to hear a lot of questions about, so practice those topics the most! Employers ask a lot of the same questions in every industry. Practice so that you’re not caught-off guard by anything in the first 5-10 minutes. Here is a free download of the top 30 questions to know. Why are you job searching right now? Questions like “why did you leave your last position?” are extremely common. So be ready to explain any past job changes, layoffs, promotions, or other moves you’ve made either within a company, or between companies. So as a final step, pretend you’re the hiring manager looking at your resume, what would they ask about your work history? That’s what to be ready for! Example: Let’s say you had a Manager position, and then changed companies and became an individual contributor and no longer managed anyone. They’re probably going to ask why. It’s not bad that you made this move, but it’s bad if you cannot explain it. Maybe it paid more. Maybe management isn’t your strength and you wanted to develop other skills, etc. But be ready to explain! Make sure your clothes are clean, professional and wrinkle-free. Don’t wear anything distracting like big earrings or bright colors/patterns. And dress a little nicer than you think you need to. If the employees at a company wear jeans, it doesn’t mean you should wear jeans to the interview. The interview is not the same as a regular day at work. Dress well! If you have any doubt, wear a suit. If you’re late, you will not get hired. So make sure you know how you’ll get there, and prepare to leave enough time. If you’re taking a train, or driving a new route, or commuting some other way to get to the interview, make sure you know how you’re doing it. And if this is a very important interview, you could even do a trial-run. Make the commute a few days before the interview to make sure nothing unexpected happens. Using the steps above will help you feel more confident walking into your interview, and you’ll make fewer mistakes that could cost you the job. Use this checklist to review before each interview. One cool thing that you’ll notice as you go – a lot of these steps get easier, or don’t need to be repeated as you go on more interviews. If you want to gain an even bigger advantage in every interview you go on, I put together a step-by-step interview guide with ALL my best strategies and tips in one single place. You can get more details here.